The Omron 10+ SERIES upper arm home blood pressure monitor has advanced features that provide users with detailed information to better manage their heart health. With a touch of a button, you can learn all you need to know about your blood pressure and be reassured you're getting an accurate reading, thanks to the Calibration Check System and the Cuff Wrap Guide. Cuff size is very important in ensuring an accurate reading every time you monitor. Before you purchase a home blood pressure monitor, determine if you will need a standard or large sized cuff. To determine your arm size, use a cloth measuring tape to measure the circumference of your left arm. One in three adults suffer from high blood pressure in America. This condition can lead to heart attacks, strokes, kidney failure, and blindness. 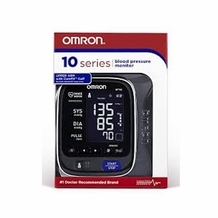 With the Omron 10+ SERIES upper arm monitor, you can monitor your blood pressure at home, and with the help of your physician, take steps to decrease your risk of heart disease. A healthy heart combined with a healthy lifestyle will help increase your chances for a long, active life.